Salzburg is a province (Bundesland) in the heart of Austria. It has a population of approximatley 530,000. The capital is the city of Salzburg with a population of approximately 150,000. The province of Salzburg is sometimes called Salzburgerland or Salzburg Land to differentiate it from the city. 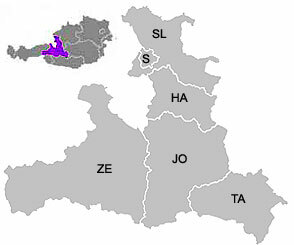 Salzburg province is traditionally divided into five regions, vernacularly known as: Flachgau, Tennengau, Pongau, Pinzgau and Lungau. Salzburg is divided into six districts (Bezirke) that match with the traditional division mentioned above: Hallein (HA), Salzburg-Umgebung (SL), Salzburg (S), St. Johann (JO), Tamsweg (TA) and Zell am See (ZE). In these, there are 119 muncipalities, of which 10 are cities (Stadt) and 25 towns (Marktgemeinde). For a visual overview, please note our Salzburg State Map with all municipalities. Good for: Bargain hotels near Salzburg; swimming and water sports (Salzburger Seenland & Salzkammergut); day-trips (Salzkammergut, Oberndorf, Großgmain). Not a touristy region! Good for: Sightseeing and more sightseeing, city holidays, opera and music, stop-over between major cities in Central Europe. Good for: Lots of skiing, hiking and other Alpine sports (summer and winter); day-trips (ice caves of Werfen, Hohenwerfen, National Park Hohe Tauern); spas and casino (Gasteinertal); golf; spa holidays in luxurious hotels. Good for: Folk culture and customs; remote, rural holidays; gentle skiing; hiking and other Alpine summer sports; day-trips (Mauterndorf and Moosham castle; show mines). Good for: Skiing and more skiing; Alpine summer sports (hiking); day-trips (Krimml, National Park Hohe Tauern, Zell am See, Kaprun, Großglockner Hochalpenstraße); water sports in Zell; spa holidays in luxurious hotels.